Assembly Engine | Adsystech Inc. The Key to the Adaptive Enterprise Solution is the integrated Enterprise Service Bus that maintains and controls the system configuration, application features and events, access parameters, user interface settings, system deployment settings, and any changes made to the system in a central data structure. Adsystech refers to this system management service as the Assembly Engine . 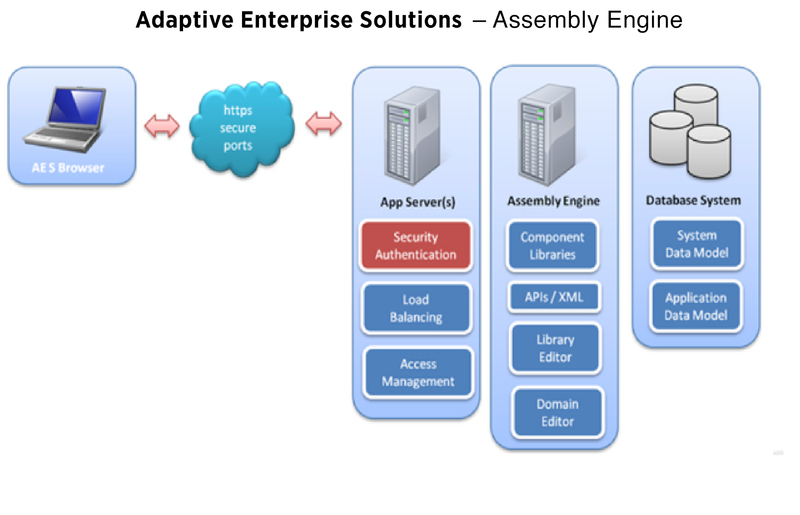 The AES Assembly Engine (and the associated Library Editor) enables system administrators to perform changes to system features normally requiring software developer time to complete – creating significant time savings in delivery of software services and provides better provisioning of system development responsibilities. Approximately 90% of application configurations, including functions, features, security and access rules are stored as an instruction set in the AES system. This structured data model approach to system design and application delivery provides significant savings in the time and expense to building (and changing) application features or workflows in the information management system. The Application Components in the Enterprise System are managed by the design instruction stored in the design database to dynamically assemble the application pages. This powerful .Net component acts much in the same way as an Enterprise Service Bus (ESB). It communicates with the server to dynamically display the application and its associated functionality. By making changes in the design database, page and application behaviors of the application are immediately updated in the system and deployed to the users via the integrated Secure Application Browser. It is estimated that 70% - 80% of software TCO is in system and application maintenance. AESenginuity enables system administrators to make codeless changes and enhancements to application features, data processes, system access and security measures - affording a tremendous reduction in time spent by software developers performing routine application updates and changes. More so - AES enables Software Developers to focus on work more in line with their capabilities – maximizing the value of development time.